This election Donald Trump just pulverized the mainstream media and they hate him for it. As his campaign was getting started in 2015 he shared in an interview with CNN’s Anderson Cooper that “60-70% of the political media is really, really dishonest” and he said frankly, “the people don’t trust you”. CNN and all of the media hated Trump for his honesty in pointing out their corruption and lies but the truth is they hated him before he called them on their biased dishonesties. Mr. Trump was a Republican running for President and therefore he was the media’s number one scoundrel. Once he jumped into the lead, he was their main target. But unfortunately for the media, Donald Trump was courageous and honest. No one ever said the things he said or managed the mainstream media like Donald Trump. Trump had a press conference earlier this year that Rush Limbaugh called ”The press conference Republicans voters have wanted to see for years”. Trump is playing the media like no one ever before. The media is forced to cover him because they want to get ratings but don’t want to cover him because he’ll upset the Democrat’s base they wholeheartedly support as pointed out by WikiLeaks. The antique old mainstream media is dying. For decades the dishonest liberal Democrat supporting main stream media has had little competition. The media told outright lies (see Ann Coulter’s 2003 book Slander) or won’t share what’s really going on if it impacts their beloved Democrats negatively (i.e. 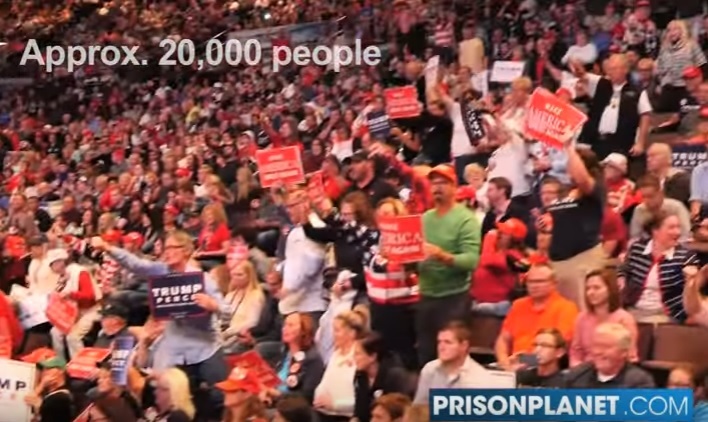 Trump had 500k at his rallies as opposed to Hillary with only 25k). Only talk radio and isolated other sources shared conservative ideas. But as old main stream news sources are dying due to their lies and bias more and more people are getting their information from the Internet and on social media. Times are changing and Trump uses social media and the Internet to counteract the old slow evil main stream media with new, fast, effective and honest Internet and social media reporting. The new media on the Internet is exploding with sites like Drudge Report, Brietbart and the GWP recording increasing record volumes of hits, tweets and Facebook shares every month. Day after day, thousands more are being introduced to the Internet and social media. WikiLeaks, Project Veritas and the incredible investigative journalist Mike Cernovich are helping spread the truth. Donald Trump is riding the wave. Hillary Clinton on the other hand requires 11 advisors to send a single tweet. Main stream media is not going down without a fight. Milo and other conservatives were kicked off Twitter, and Facebook and the rest of the media are working with the Clintons (see WikiLeaks) to get Hillary elected. Obama even went so far as to surrender the Internet to a non US government entity that many fear will eventually prevent free speech on the Internet. Trump has proven he will stand up to the lying media. We must keep the Internet free for our children and Trump is the only candidate that can do this in 2016. Hillary wants to keep the people ignorant per a recent email released by Wikileaks. A vote for Trump is a vote for free speech but a vote for Hillary is a vote for liberal control of what we see, hear and share.